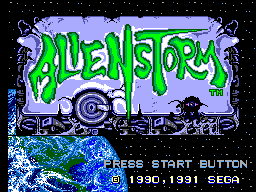 Despite its appearances, Alien Storm is actually more of a Golden Axe/Streets Of Rage type game than anything else. It seems a little daft that a bloke armed with a laser cannon can only point it about a foot from himself and shoot, but that's the way it's got to be (the robot at least has the more sensible looking electric whip, while the sadly absent token lady had a flame thrower - not exactly renowned for its range). So it's the usual walk, usually punch but here we shoot, dodge pattern you find in scrolling beat-'em-ups. But wait! There's a twist. There are two more styles of play to be had: a rail shooter and something halfway between the regular game and a shmup. Trouble is, the rail shooter bits are a little disappointing since your cursor moves so slowly that when an alien pops up and the bottom of the screen there's no time to get him before you're hit. Not even with the reflexes of a cat on caffeine. It'd be too much to ask, but phaser support would've made in so much more fun. But hey, there's the running shooter bit isn't there? Well not really. If you're really awful you might get hit by something but for the most part, stay extreme left and shoot... end of stage. 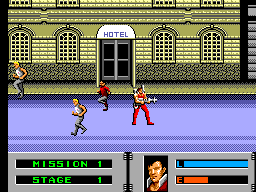 It's all very disappointing, though the Mega Drive version has sections which are equally embarassingly easy. Graphically it's not all bad. The main trouble is that as a conversion it's always going to look naff to anyone who's played the bigger brother versions. 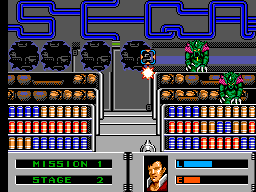 The basic jumping aliens and rail shooter sections look remarkably similar to the 16-bit version but everything else looks quite bad. It's a good effort for the Master System but really it would've been better to design all-new sprites rather than downgrade the look of the arcade ones. Those menacing aliens with a huge mouth and absorbed skulls on the back? They're goo blobs with piles here. Even the bosses look quite tame and have a few attacks missing. What is really neat though, is that as either the bloke or the robot you have a load of different attacks depending on how close you are to the enemy. Unlike the 16-bit versions, using energy weapons doesn't drain your energy so everything does exactly the same damage (funny that a gun has the same effect as a good stomping), but it's still a nice effect to see. It's rare the Master System outdoes itself with music and although what you get here is no Power Strike soundtrack, it's all rather passable. Likewise with the sound effects, nothing is mind-crushingly bad but in all honesty there's no loss of gaming experience through playing this on mute with a decent record on. Now here's the good news. Everything except running survives (though why the double tap direction to run is omitted, especially since Golden Axe copes, is quite bizarre) and if anything it's a bit more responsive than the Mega Drive version. Or perhaps that's just the cut down animation making things easier. So unlike the 16-bits there are less incidents where you're attacking then try to dodge a rear attack only to fail. Button 1 shoots, stamps or whatever. Button 2 does a funky roll that's pretty useless in this version, while both together is your special "smart-bomb" attack. Alas the bloke doesn't summon a gunship, he's stolen the lass's far easier for an 8-bit to cope with giant bullet. And here lies the problem. Rather than being a Sonic The Hedgehog and going for a different game completely, you've got a cut-down version on the Master System. So if you've seen the far superior 16-bit version this is just a once-through out of curiousity. There are two "final" bosses to face (I say final because after them is a really easy rail shooter bit) - one is lifted from mid-game in the 16-bit version while the other is entirely new but sadly totally harmless. It's a fun diversion from time to time but honestly, if you've got a Mega Drive play that version instead because it's much more fun, a better experience and has a two player function. Oh, and did I mention it's easy? Well it's really easy. If you've never seen the arcade game or its Mega Drive conversion then this is a pretty neat game. However it falls into the category of cut-down 8-bit release, and unlike games like Chuck Rock or Robocop vs The Terminator, the changes aren't just aesthetic they're wholesale. It's a shame because there core is there but it tries too hard to emulate its bigger brother and in that, it is always destined to fail. For completists and non-Mega Drive owners only.